Utah Jazz center Rudy Gobert chuckled while recalling his mom proudly playing a VHS tape when he was a child so he could watch the movie Coming to America. Eddie Murphy starred in the 1988 comedy about a pampered yet humble African prince who traveled to New York City in search of a wife. Gobert’s mom didn’t want her son to watch Murphy as he played the roles of Prince Akeem, soul singer Randy Watson, Saul the Jewish barbershop customer and Clarence the barbershop owner. She wanted Gobert to see his father, Rudy Bourgarel, in his don’t-­­­blink cameo during the movie’s basketball scene. Since coming to America from France, Gobert has gone from a project center to a budding NBA star who is making his playoff debut this weekend. He had a basketball role model in his father. Bourgarel played at Marist College from 1985-88 and backed up former Indiana Pacers star Rik Smits. Bourgarel averaged 10.7 points and 6.8 rebounds during the 1987-88 season, while Smits averaged 24.7 points and 8.7 rebounds. Even with the 7-foot Bourgarel and the 7-foot-2 Smits, the Red Foxes didn’t play in the 1988 NCAA tournament after participating in it the previous two seasons. Unbeknownst to Bourgarel, footage from Marist’s loss to St. John’s at New York City’s famed Madison Square Garden on Dec. 28, 1987, ended up being immortalized in the scene in which Prince Akeem went to his first basketball game. “He knew about it when the movie came out, but he didn’t know that night they were shooting it,” Gobert said. After his junior season at Marist, Bourgarel went home to France to complete his mandatory military duties. He also played professionally for Racing Club de France, Saint-Quentin Basket-Ball and ASPTT de Toulouse from 1988-94. He was a member of the French national team in 1988 that didn’t qualify for the Olympics in South Korea. Ex-NBA player Makhtar N’Diaye, a Senegal native who grew up in France, said Bourgarel probably should have been the NBA’s first French-born player. “He was a tough guy. Strong. A little wild,” N’Diaye, now a scout for the New York Knicks, told The Undefeated. “When you see Gobert, you can see a little bit of his dad in him. He could’ve easily been the first [French-born] NBA player. Back then, NBA teams didn’t put much value into blocking shots and rebounding. They didn’t think European guys were strong. They thought they were soft. The first French-born player to make the NBA was ex-San Jose State star Tariq Abdul-Wahad, who was drafted by the Sacramento Kings with the 11th overall pick in 1997 and played in the league for six seasons. Abdul-Wahad recalled watching Bourgarel play in France. “Rudy Bourgarel was an incredible athlete: long, lean and athletic. One of the first Caribbean-French players to play college basketball. I used to go watch him play in Paris when I was, like, 14 years old,” Abdul-Wahad told The Undefeated. Gobert was born in Saint-Quentin, Aisne, in the north of France, on June 26, 1992. Once he was old enough his father began teaching him the game of basketball. After playing professionally in France, the 7-foot-1 Gobert declared for the 2013 NBA draft. He set draft combine records for wingspan (7 feet, 8 ½ inches) and standing reach (9 feet, 7 inches). The Denver Nuggets drafted him with the 27th overall pick in 2013 before his draft rights were acquired by Utah. Gobert struggled as a rookie for the Jazz, averaging 2.3 points, 3.4 rebounds and 0.9 blocks in 45 games during the 2013-14 season. Rudy Gobert (No. 27) of the Utah Jazz reaches for the rebound against the Memphis Grizzlies during the game on April 10, 2015, at EnergySolutions Arena in Salt Lake City. “The people that knew his dad knew Rudy would eventually grow into aggressive and a go-getter, but at first he came across as a gentle giant,” N’Diaye said. With hard work on his game and his body, Gobert has become one of the NBA’s most intimidating defenders and a much-improved scorer. He entered the Jazz’s regular-season finale Wednesday against the San Antonio Spurs averaging career highs of 14.1 points, 12.8 rebounds and 2.7 blocks per game while shooting 66.6 percent from the field. “I just kept working, kept believing. 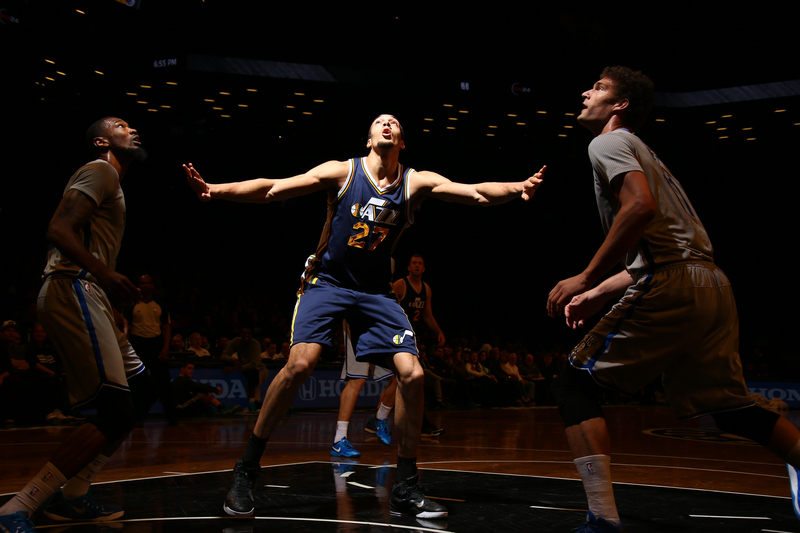 … I feel like I’ve still got a lot to learn and can get better,” Gobert said. Gobert’s play garnered him strong consideration as a 2017 Western Conference All-Star reserve. Durant said Gobert “changed their team and is the reason why they are so good.” Even with that praise, Gobert was snubbed for the All-Star Game while Jazz teammate Gordon Hayward was selected by the conference’s head coaches. Gobert seems motivated by the snub, as he has improved to average 16.8 points on 70.8 percent shooting from the field, 13.3 rebounds and 3.1 blocks since the All-Star break. Gobert is one of the top candidates for the 2017 NBA Defensive Player of the Year and Most Improved Player of the Year awards. He leads the NBA in blocks per game, is second in field-goal percentage and is fourth in total rebounds and rebounds per game. Gobert said one key for his defensive prowess is he worked hard on his body in the offseason to help him become tougher and healthier while also becoming more active. While Warriors forward Draymond Green and San Antonio Spurs forward Kawhi Leonard offer stiff competition, Gobert is a viable candidate for the NBA Defensive Player of the Year award. “It would be great to win. 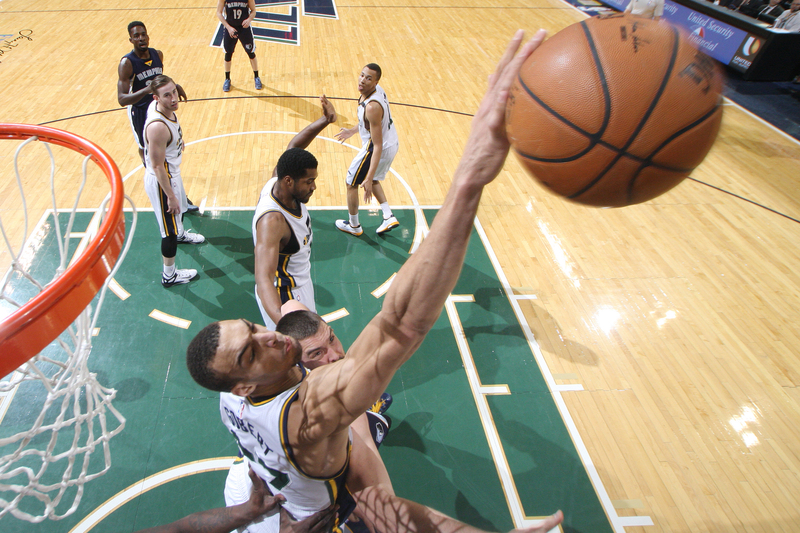 It’s one of the things I take pride in: defense,” Gobert said. Now Gobert is coming to the NBA playoffs. Rudy Gobert (No. 27) of the Utah Jazz looks for the rebound against the Brooklyn Nets during the game on March 8, 2015, at Barclays Center in Brooklyn, New York. “This is the first time for me, so I’m very excited,” Gobert said. “We’ve worked hard to get to this point. We want more. I’m a basketball fan, first, and I’ve always loved to watch the playoffs. I always wanted to be part of it. This time I will be on the court, will be on TV.